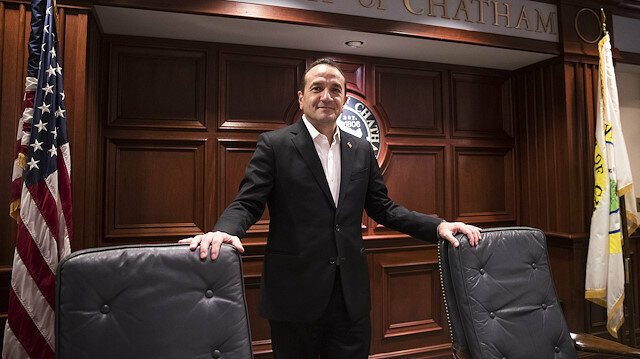 Tayfun Selen, the first Turkish-American mayor in the U.S., said his election would be a "source of inspiration" for the diaspora. “I think that my election as a mayor may be a source of inspiration for Turkish people and young people living here, and also an occasion for Turks to go into politics," Selen told reporters on Thursday. Selen, 47, was sworn in as mayor in Chatham Township in New Jersey on Jan. 4. The Turkish Consulate in New York congratulated Selen, tweeting: "We congratulate Mr. Tayfun Selen who has been recently elected Chatham Township Mayor (NJ) wish him success." He said he hoped to serve as a mayor that the citizens will be proud of. A famous Turkish pizza maker in New York was awarded on Thursday for being a successful immigrant.Organized by the Dr. Ellis Island Honors Society and American Immigrant Society (AIS) for the first time this year, the Beacon Awards ceremony was hosted by Turkish-American celebrity surgeon and talk show host Dr. Mehmet Oz to reward successful immigrants.AIS President Murat Koprulu said that the award ceremony was a very important initiative with an aim to reward young immigrants and those who want to take new initiatives in the U.S.Turkish pizza maker and owner of Champion Pizza Hakkı Akdeniz received an award for his success as an immigrant.When he said that nobody knew he was once homeless, Akdeniz received a great amount of applause with telling his life story while he was on stage to take his award.He received a total of 12 awards, including two from New York City Governor Andrew Cuomo, one from New York Mayor Bill de Blasio, one from New York Senator and one from Senate Minority Leader Democrat Chuck Schumer.Daphne Oz, the daughter of Turkish surgeon Oz, health program presenter and nutritionist, was also awarded in the night.Champion Pizza chain with its seven branches have already become a popular hangout for Hollywood stars. The walls of the restaurants are covered with the pictures of Hollywood celebrities from Morgan Freeman and Keanu Reeves to Neil Patrick Harris and Susan Sarandon.Akdeniz is also known for his help to those in need, poor and homeless.After Hurricane Maria hit Puerto Rico in 2017, the owner of the pizza chain announced he would give free pizzas to New Yorkers who would bring water, candles, batteries, flashlights, diapers, vitamins, paper towels and other essential supplies to his restaurants as donations.Partnering with American rapper Jay-Z, Akdeniz sent two trucks loaded with supplies to Puerto Rico.Akdeniz started from scratch and saved enough money to open up his first restaurant and now gives free pizza, shoes and clothes to the homeless people and those in need every Wednesday.